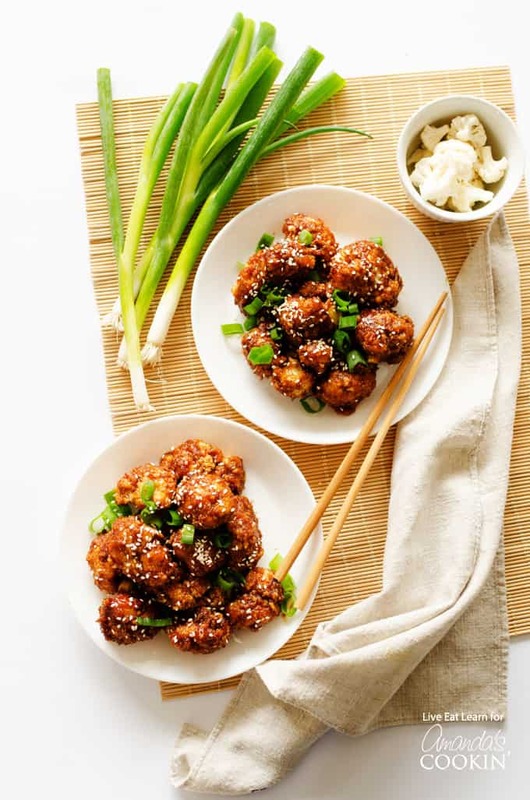 Sticky Garlic Cauliflower: a healthier version of Chinese takeout! Love Chinese takeout but trying to eat a bit healthier? 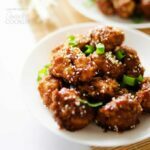 This Sticky Garlic Cauliflower tastes just like the sticky garlic chicken dishes at your favorite Chinese place, but made completely from veggies! 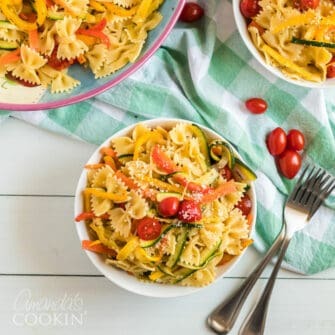 I know that as a food blogger I should be comfortable with all types of cooking, but there’s one type of cooking that I just hate. And not because it’s unhealthy or anything, but because I’m a huge scaredy cat who is already a walking fire hazard, even without the addition of this cooking method. Can you guess which it is? Yep, frying. I hate frying! But sometimes this aversion to frying helps me to create the best (much healthier dishes). Case in point, Asian-style cauliflower. 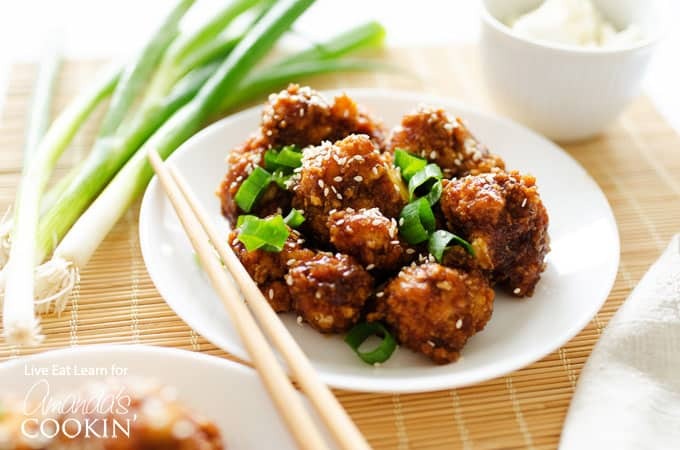 We made General Tso’s Cauliflower a while back, and today we’re changing it up to make Sticky Garlic Cauliflower! And the secret to non-fried yet crispy cauliflower? A quick dredge in panko! Making this Sticky Garlic Cauliflower is easy. We’ll chop up some cauliflower and dredge it in flour, then whisked egg, then panko breadcrumbs. We’ll bake this to make the cauliflower nice and tender and the breadcrumb coating light and crispy. Meanwhile, we’ll heat up our sauce ingredients until they form a sticky, thick sauce. Then just toss with the cauliflower to coat and serve! In the time it would take for you to order Chinese delivery, this delicious plate of Sticky Garlic Cauliflower could be warm and ready on your table. Enjoy! Don’t miss out on more deliciously healthy recipes like these Chickpea Gyro Lunch Boxes, this Mix and Match Healthy Meal Prep, or this Fall Quinoa Salad! Preheat oven to 400 degrees F. Arrange workspace, placing flour, egg, and panko in separate bowls. Mix salt and pepper into panko. Cut cauliflower into bite-sized florets. Working in batches, coat the florets in flour, then egg, then breadcrumbs. Set on a parchment paper-lined baking sheet. Bake for 15 to 20 minutes, or until crispy. Set a small saucepan over medium heat and add all “Sauce” ingredients. Whisk to combine and bring to a simmer and cook for about 5 minutes, until it begins to thicken. Drizzle sauce over the baked cauliflower and gently toss to evenly coat.